OK maybe I'm an ignoramus for asking this: but how exactly did they make that mask? Is it her actual mummified and preserved head or is it just a wax copy they made from her cut-off head after the execution? You know that's how mme Toussaud started her business, making wax copies of the heads of famous ppl killed by the guillotine in the French revolution! I wonder, after reading your post in the intro board, do you have a physical resemblance to this Stuart lady, like the pretty red hair? A new facial reconstruction showing Mary Queen of Scots may have looked at the end of her reign has been released to mark the opening of a new exhibition on the life and legacy of the queen. A team of experts led by Professor Caroline Wilkinson of the University of Dundee and Janice Aitken from Duncan of Jordanstone College of Art have pooled their expertise to produce the animated reconstruction, commissioned by National Museum of Scotland.Professor Wilkinson, a cranofacial identification expert, also worked on the facial reconstruction of King Richard II of England last year. Whoa! Looking good there, Mare! Forensic Anthropology is amazing. Incredible - I can't stop looking at her! I would say QEI looked better. No way. Mary was renowned for her beauty and charm. 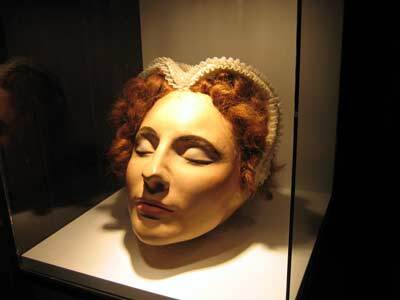 this is Mary's death mask, and is more life like than portraits done around the time or later. I see this as the face of The Queen of Scots. She was a pretty woman, by all accounts, indeed Elizabeth's ambassadors would talk down her prettiness to their jealous Mistress. No way! I'm thinking QEI would have been mighty jealous. I find it odd we've never chatted about her at all. She was such a pivotal part in history in so many ways. She was such a romantic yet tragic figure from start to finish really, wasn't she? The loss of her father soon after she was born, widowhood at 18, being forced to leave France where she'd been happy and of course the marriage to Darnley and his mysterious death. Her son James couldn't remember her at all, and he doesn't seem to have resembled her, either physically or in character. On the flip-side, she never struggled for her crown, she lived in the lavish, pampering court of France, and up until the death of her husband, lived completely secure from almost all kinds of perils that Elizabeth faced as a child, teenager, and young adult. One thing I do find inexcusable, is how the Scottish nobility never in any case worked on her behalf or that of Scotland. They accepted English gold and worked against Mary's ability to practice her faith, much less assert her authority as Queen of Scotland. James V of Scotland died prematurely because of the relentless struggle just to deal with the nobility, much less run the country effectively. They were so busy with their feuds that Elizabeth easily manipulated and kept Scotland in chaos. It's no wonder Mary tried desperately to cling to any man she thought would be able to end up helping her deal with the nobility, much less run the country. At least in England, Elizabeth had her councilors to help her and the nobility pretty much understood why keeping Elizabeth in power was a good idea. Darnley was also of Tudor descent so James V1 (1) was descended from Henry V11 through both of his parents. one of the things I think is interesting about Mary Stuart and Elizabeth is that they took completely different paths with respect to marriage. Mary sought a partner - someone who could help her in her fight to protect the throne and herself, Elizabeth played men - she was not willing to trust a man to be a partner. Mary Guise - MS's mother - she knew how to be ruthless - she knew how to protect the throne for her daughter - she knew how to protect Scotland from the English - she was one tough character. But she did not teach her daughter. No, very true. Mary did not teach her daughter statecraft. 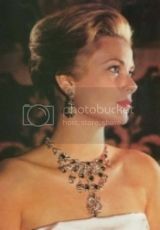 Of course, she was very young when she was sent over to France to be trained as a Queen Consort. Mary Queen of Scots also proved to have bad judgement when it came to men, unlike Elizabeth. She basically fell in love with a pretty boy, where Darnley was concerned. Of course, we are all products of our environment, and her cousin Elizabeth had faced many dangers before she had reached the throne of England. I don't think she ever really wanted to marry anyone except Robert Dudley, and of course he had Amy Robsart as unfortunate baggage! Her ministers too, were very much against her wedding one of her subjects. All in all, I think Mary's bad judgement let her down again and again. Plus of course, 16th century Scottish court politics proved to be a very wild and complex situation! Thing is, Mary was in France the entire time being pampered and protected, not someone who was being told regularly and asked about what should be done. I wonder how different things might have been for Mary if in fact Mary had been raised in Scotland and become as tough as her mother. As for Elizabeth, Elizabeth only had herself to rely on and make choices to protect her. Mary had only had positive examples of marriage, while Elizabeth had horrific ones. I'm amazed Elizabeth stayed sane, much less ended up getting and keeping the throne. To Mary, marriage was something to enhance her life and pamper her. Mary was more interested in leaving Scotland behind and going off to a new royal court and be a Queen Consort again and end up with a charmed, pampered, effortless life. With Elizabeth, she only wanted her own crown and to be able to be in control and not at the mercy of any man. I'm not so sure Elizabeth stayed sane. The campaign she has waged in Ireland is not the work of a sane woman. And her days before her death show a woman terrified of being called to answer for what she did throughout her life - terrified of death. I have always thought the problem for the Scots is that they kept one foot in their ancient gallic traditions - Kings had to be warriors and lead their troops into battle - hence Scottish Kings die and die young. The other foot though was in the Norman-English world so they follow primogeniture instead of the gallic tanistry. As a result they have these young children ascending the throne with regencies and all of the intrigue and fighting that goes on with a regency. So they never really consolidate the power of the King and Scotland. Hence the bitter never ending court intrigues - that get violent. If they had both feet in one of those worlds - gallic Kings as warriors and tanistry so that adults get the throne when the King dies or the English way of Kings who stay in the castle and can afford primogeniture they would have been much better off. Mary becomes Queen of Scotland when she is a few weeks old. They had to prop her up at the coronation and stuff the interior of the crown to put it on her baby head. I saw a docu on Westminster abbey that was fascinating - one of the things they showed was that paintings (some of) of Elizabeth have been altered in the 1700's. When they do conservation work on these paintings they x ray them and they have discovered that Elizabeth's face has been painted over - the original face is harsh and sometimes even scary the painted over faces show her as prettier and less scary looking. Elizabeth was a ruthless butcher and I think the admiration for her comes from her people since her people never had to deal with what the Irish and Scots had to deal with. Would be interesting to find out if whether or not Mary would have been the same, or if she had been a fanatical persecutor of the people. Initially Mary promoted religious tolerance and didn't mind Protestantism as long as she could practice her religion in private and yet, she was hassled about that too. I think few people could really handle Scotland. Although Ireland was one of her two kingdoms, Elizabeth faced a hostile, and in places virtually autonomous, Irish population that adhered to Catholicism and was willing to defy her authority and plot with her enemies. Her policy there was to grant land to her courtiers and prevent the rebels from giving Spain a base from which to attack England. In the course of a series of uprisings, Crown forces pursued scorched-earth tactics, burning the land and slaughtering man, woman and child. During a revolt in Munster led by Gerald FitzGerald, Earl of Desmond, in 1582, an estimated 30,000 Irish people starved to death. The poet and colonist Edmund Spenser wrote that the victims "were brought to such wretchedness as that any stony heart would have rued the same". Elizabeth advised her commanders that the Irish, "that rude and barbarous nation", be well treated; but she showed no remorse when force and bloodshed were deemed necessary. Thing is, that according to the biography of Stefan Zweig, Mary wedded Darnley since Elizabeth made it clear to foreign envoys (and by proxy the foreign governments) that any marriage to Mary Queen of Scots would be considered an act of war. So go figure, Mary practically had no other real options but to marry Darnley. I just find it ironic that Elizabeth had an abhorrence of marriage, but wanted Mary to be as miserable as she was. I just wonder, did Elizabeth set Mary up? In the film of Mary where Mary is played by Vanessa Redgrave and Elizabeth by Glenda Jackson, Darnley was sent by Elizabeth purposely to woo Mary. I wonder if it was also to keep the Tudor bloodline as Darnley, Elizabeth and Mary all were descendants of Henry V11.